Loosen the tops of the Oreos. Melt Candy Melts following package instructions. (If using white chocolate chips, microwave at 50 percent power, stirring every 30 seconds.) 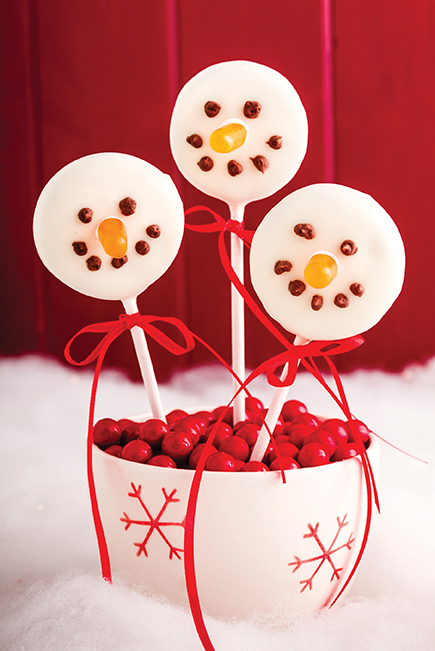 Once the chocolate is melted, dip each lollipop stick in the melted chocolate, getting a little dab on the end of it. Then insert through the cream center of the Oreo and place the top back on. Repeat with all cookies, and then place on a tray in the freezer for 5 minutes or until sticks are well-set. Once they’re set, dip each in the chocolate, turning them to take off any excess. Place each pop on a parchment-lined cookie sheet. Here’s where the helper comes in: While you continue dipping the cookies, have your helper begin creating the faces. Pipe eyes using dark chocolate icing. Pipe dots of dark chocolate icing into the shape of a mouth. Pipe a dot of white chocolate in the center of the snowman’s face. Place a Mike and Ike orange candy in the center for snowman’s nose, or an orange Jelly Belly sliced diagonally to look like a nose. Once they’re smiling back at you, put them in the fridge to cool. Cut pieces of ribbon and tie them in a bow around the candy stick.